That’s a common question among Canyon Road visitors when they see historic work by Henri de Toulouse-Lautrec, Paul Gauguin, Salvador Dali and other famous artists on our walls. There’s no supermarket for art like this. Finding and authenticating it is an elaborate process, and the treasure hunt often begins where you’d least expect it. If you’ve ever wondered about the value of that painting or print on your wall (or in your attic), we might be able to help. We’ve been in the fine art business for over 15 years, and have assisted hundreds of clients in selling their historic and vintage art. Whether you own a Renoir lithograph or an exquisite painting by a little-known American modernist, a sculpture by Arnaldo Pomodoro or a watercolor by an anonymous 19th century artist, we’d be delighted to take a look at it. We’re primarily interested in art from four categories: European, American, Southwest and Contemporary. It could be a single work or a collection within any price range. If you’re looking to sell or consign, we offer fair prices. Contact us at info@thematthewsgallery.com to get the process started, and check out our website and Facebook page to learn more about us. You can see rare prints by Francisco Goya at the New Mexico Museum of Art’s Renaissance to Goya: Prints and Drawings from Spain, the only U.S. stop of a special traveling exhibition from the British Museum. Learn about Salvador Dali’s twist on one of Goya’s most famous works below, and come see it at Matthews Gallery on Canyon Road. The hardly whimsical opus was a critique of 18th century Spain, which Goya depicted as full of deformed monsters and foolish beasts. The artist avoided punishment at the hands of the ruling class when the king spoke up for him, but the prints were still withdrawn from public sale in 1799. 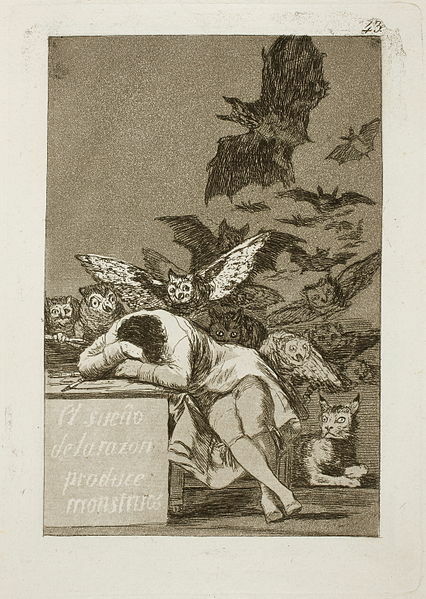 174 years later, The Sleep of Reason Produces Monsters (left) from Los Caprichos was considered one of Goya’s most iconic works, and another Spaniard by the name of Salvador Dali decided to create a Surrealist tribute to the series. In the etching Frontispiece for Goya Suite Dali used the first image from Los Caprichos, a self-portrait of Goya in a top hat. Dali drops Goya into a universe even more bizarre than that of the original Caprichos, stitching his predecessor’s visage atop the body of a dragon-like beast. A second, more monstrous head with a drippy nose and lumpy halo emerges from behind Goya, and a shadowy figure in the distance leaves a trail like a comet. Is Dali’s remix another critique of Spanish society, refreshed for the weird world of 1973? The artist drops a slippery hint in this work’s alternate title, Lenguado Menguado. Lenguado could mean “flat-fish” or “sole”, and menguado is either “well-dressed” or “diminished”. So, Dali could be calling Goya a stylish fish or a diminished one. The title might refer to the worn—or fashionable—shoes of the pedestrian in the background. In any case, the artist seems to be commenting on Spain’s obsession with appearances, a theme first explored in several of Goya’s Caprichos. Of course, Dali was himself an offender when it came to sartorial dalliances, but that adds some spice to the criticism. 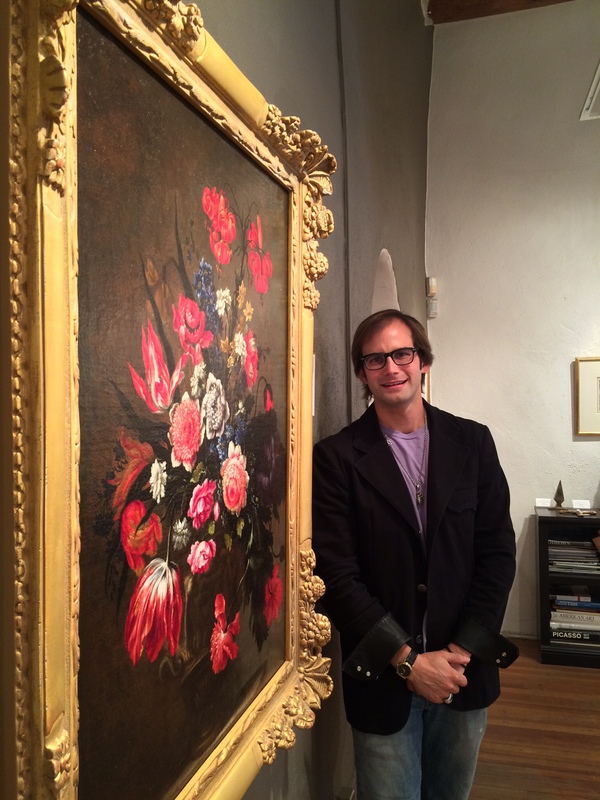 View Dali’s bizarre reworking of a classic Goya print at Matthews Gallery, and connect with us on Facebook, Twitter and Pinterest for more news from Canyon Road.